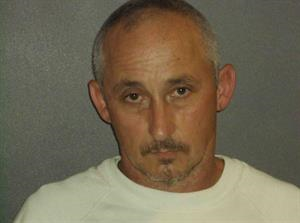 HOUSTON COUNTY – A Houston County man is behind bars after admitting to numerous burglaries and thefts of sellable metals. George Lynn Mullin, 51 with a listed Crockett address, was booked into custody and charged with burglary of a habitation after a non-custodial interview with Houston County Sheriff’s Office (HCSO) Investigator Jerry Kaelin. The HCSO Investigator identified Mullin as a suspect in the oilfield thefts and went to his residence to question him about the most recent theft. “A non-custodial interview was conducted with Mullin at his residence, where Mullin admitted to numerous burglaries/thefts that were associated with metal sales linked to Mullin and identified in the Texas DPS metals database,” an affidavit of probable cause stated. Mullin further informed Kaelin his most recent metal acquisition came from an abandoned house across the road from his residence on FM 232. The metals were sold on Jan. 24 and included 14 pounds of copper, nine pounds of brass and 14 pounds of aluminum. The owner of the property from where these metals were taken was contacted and “… confirmed Mullin did not have permission to be on his property,” the report stated. He was booked into custody and charged with burglary of a habitation, a second degree felony. Mullin is being held at the Houston County Jail on a $30,000 bond.